Looking to add a pirate theme to your kid’s bedroom? Check out the bounty of treasures available here at Price Right Home including toddler beds, duvet covers, bedroom accessories and more. All our pirate theme goodies come with free UK delivery. 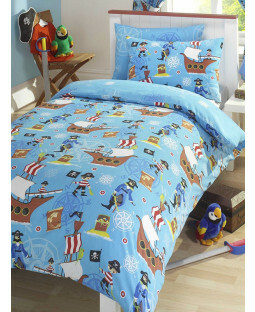 Young buccaneers will love our choice of pirate themed duvet covers and pillow sets. 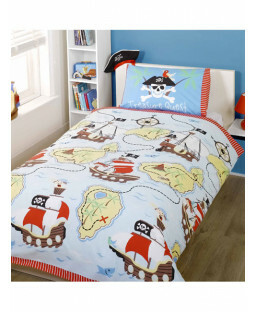 Find the perfect bedding with designs featuring cartoon pirates, treasure maps and pirate ships – available in sizes to fit your child’s single bed or double bed. There’s even pirate themed toddler beds complete with fun pictures of pirates sailing the high seas to help your little one transition from cot to big bed. 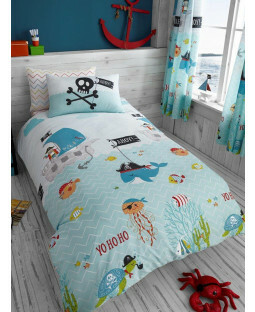 Add the finishing touches to your child’s pirate themed bedroom with some cosy soft furnishings. Pirate shaped pillows, blankets and more help to create a fun and relaxing space that’s perfect for playtime and bedtime.